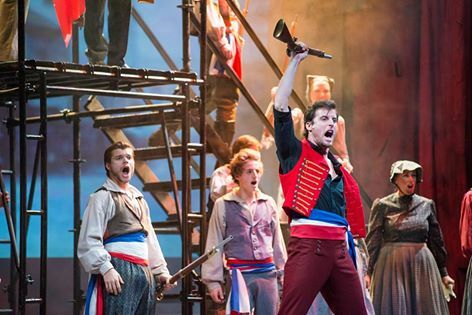 Voices carry Jesse Cline’s triumphant production of “Les Misérables” at Media Theatre. The singing of Elisa Matthews, Lauren Cupples, James Zannelli, Sean Thompson, and John D. Smitherman is emotive and expressive to the extent it gives, rather than merely adding, depth to the musical’s primary characters. Kelly Briggs’s clowning as Thenardier brings great definition to scenes dominated by this rascal and demonstrates how being sly and to the point trumps being big or bombastic in such important comic roles. Everything about Cline’s production coalesces to bring Victor Hugo’s monumental story of people striving to survive in an age of transition and hardship to glorious life. Nothing lags in this staging. Even sequences that frequently dull the musical’s bite, such as the Montreuil scenes leading to Fantine’s fall or Cosette’s wedding, engage because of Cline’s emphasis on human nature and the strength of his cast’s characterizations. Matthews, in particular, makes Fantine heartrendingly pitiable. Her beautifully sung “I Dreamed a Dream” has rarely been informed with so much pathos, and Cline sets up Fantine’s spiraling descent by pointedly having Jacqueline Rosenthal’s jealous fishwife and J.P. Dunphy’s dandy goad her to destitution and despair. Cline’s is a production of well-placed detail that focuses on individual plights rather than on 1832 Paris in general and stresses clear, concise storytelling over epic presentations. The choice to keep scenes small and accessible is a good one. It makes “Les Misérables” intimate and immediate. Scope is not lost. Cline knows how to fill a stage and ignite hubbub. His gift is in knowing to how to go from an establishing mise en scene to the moments and figures that count the most in making “Les Miz” moving and powerful. Herbert Kretzmer’s translations of Alain Boublil and Jean-Marc Natel’s lyrics get more attention and convey more meaning because of Cline’s approach, which also benefits Claude-Michel Schonberg’s music. Last year, while reviewing Cline’s production of “Joseph and the Amazing Technicolor Dreamcoat,” I said that Cline responds most creatively to a theatrical challenge, to complex plays that need careful presentation to register fully. His staging of April’s “Sunset Boulevard” and this rendition of “Les Misérables,” make my case. Cline’s thoughtful direction and attention to human behavior take Boublil, Schonberg, and Natal’s popular contemporary classic and make it into the work of art a theater piece derived from one of world literature’s greatest works ought to be. Yes, being me, I’ll have some nitpicks, but my cavils matter less than ever. They did not distract from nor critically diminish Cline’s wonderful achievement with this production. I’m not even going to list them until the end of the review. There’s too much excellence to discuss. Texture is evident from the start. Christopher Ertelt’s orchestra gives weight to Schonberg’s music. The male chorus gives baritone emphasis to the grunts of the prisoners toiling without mercy next to “Les Miz’s” principal figure, Jean Valjean (although Cline chooses not to having Valjean on stage as a laborer). The tone of the chorus is important. It imparts the seriousness of a “Les Miz” production. A weak first scene usually betokens a lax performance. The Media’s “Les Miz” begins robustly, a paradox considering the convicts look beleaguered and sound spent. All remains taut during the scenes in Digne when Patrick Ludt’s gracious priest shows charity to Valjean and spares him from more years of penal servitude. Elisa Matthews, as an actress and a singer, makes the entire sequence featuring Fantine a treasure to behold. Matthews is so delicate in her portrayal of her character. This is a clearly a Fantine who is not meant to scrounge and has no talent for it, especially when she is crossed by debased townspeople who notice her patina of class and seek to spite her. Matthews takes her character on a journey of demoralization that is apparent at each denigrating step. Her weariness grows to resignation until her pride and breeding prompt to lash out at condescending cruelty. You see what I mean by texture. Fantine’s plight is always pathetic. How often is it discernably disheartening and painfully moving to witness? Elisa Matthews makes it so. She doesn’t play by rote or depend on Hugo or Boublil’s depiction of Fantine. She creates a full character. This reliable actress cannot help but bring depth to roles she plays, but she eclipses herself on this occasion. I’ve often said if I had a theater, I’d create a season of musicals for Elisa Matthews (“Carnival” and “She Loves Me” leading the way). After seeing her as Fantine and hearing her haunting “I Dreamed a Dream,” I would be more committed to that plan than ever. Matthews defied cliché in a good song that has become too familiar for its own good. That shows her artistry. The only regret is Fantine disappears, necessarily, from “Les Miz” for two hours once the passage she dominates is completed. Matthews continued and enhanced an impression I’ve had since seeing her in “My Fair Lady” several seasons ago. Lauren Cupples, playing Cosette, has a positive breakthrough that brings her to a new level of performance and provides me a second soprano around whom I could build a season. Cosette, in spite of her importance to Hugo’s story, can be a cipher in Schonberg’s musical. Her role is often perfunctory, with Cosette fading into functionary oblivion while Eponine is the ingénue that rules the day. Cupples changes that impression of the character. Her Cosette is immediately endearing, mainly because of the feeling with which Cupples sings “A Heart Full of Love” and the longing love-at-first-sight look she gives Zach Monroe’s Marius when he persuades Eponine to lead him to Cosette. Cupples endows Cosette with grace and felicity. She is schooled by Valjean to be a modest young lady, and Cupples conveys that breeding while being able to show ardor in Cosette’s scenes with Marius. The purity and luster in her voice also denote the care and strictness with which Cosette was raised. This is an ingénue to be savored and cherished. There is depth in her soul that Cupples reveals in Cosette’s voice and eyes. Sarah Moya is tomboyish and provoking as Eponine. A waiflike street Arab who can scuffle with the best of them, Eponine also has a sentimental side that Moya shows in her infatuation with Marius, a neighbor who regards Eponine as a buddy and rarely considers that she is a woman and is emotionally committed to him. The beautiful voices and superb acting of the young women in the cast give Cline’s “Les Miz” its heart. They make the production more of an ensemble that centers on the key figure of the moment rather than on the perennial conflict between Valjean and the police officer who has no faith in reform or redemption, Javert. John D. Smitherman as Valjean and James Zannelli as Javert are excellent. They would have to be for this “Les Miz” to be thorough in its arresting effect. More about them in a bit. Kelly Briggs and Susan Wefel as the Thenardiers are next in line for praise and appreciation. Briggs is nothing short of a wonder. He creates a crafty Thenardier who is so happy with his larcenous, duplicitous prowess, we have to take delight in his antics even as we disapprove of them. Unlike most Thenardiers, Briggs takes being called a “bon viveur” seriously. There is a congenial cordiality in the character when he is running his inn and a swagger as he leads a team of thieves and con men through the seedier arrondisements of Paris. You can see how the inn customers would trust Thenardier and revel in his company. He exudes charm and wit. He enjoys being a reprobate and feels superior to his prey. At first sight, Briggs’s Thenardier doesn’t seem ragged. His lapse in sartorial taste doesn’t occur until the scenes in Paris. Best of all, Briggs simultaneously preserves a comic and roguish tone. He doesn’t disguise Thenardier’s villainy as much as he couches it in wily confidence. Susan Wefel is an able match for Briggs’s heists and hijinks. She convinces when she sings disparagingly about her husband in “Master of the House,” and she has the seasoned comedian’s gift for being light while being filled with gall and guile. Played by Briggs and Wefel, the Thenardiers never wear out their welcome, not even during the wedding scene in which their appearance frequently becomes tedious. They are particularly good in the scene in which Javert has them dead to rights but loses the eyewitness he needs to confirm their crime and press charges, a wary Valjean. They also make “Master of the House” a delightful and sprightly change of pace, Briggs setting the tone and Wefel masterfully follows his lead. With so much talent around him, John D. Smitherman is relieved of having to carry this “Les Misérables” as Valjean. He does anchor it with a younger approach to the character and an expressive singing voice that conveys the thought behind Valjean’s reveries and sentiments. Smitherman brings affecting beauty of “Bring Him Home,” a song determined to test a tenor’s range and stamina. The quality of his voice, and the sincerity of his plea, become a highlight of Cline’s production. Smitherman also displays genuine tenderness in the scene in which Valjean rescues the young Cosette from the guardianship of the Thenardiers. James Zannelli is a staunch and committed Javert. You have no trouble believing Zannelli’s character is moralistic and vindictive when it comes to doing his duty to enforce the law. There is no softness or doubt in this Javert. His soul leaves no room for mercy or understanding. To him, the law is absolute. It is not worth pondering whether a law or an arrest is just. Statutes are codified, parole has its regulations, and any breach must be punished firmly and severely. You can see the determination, almost a hunger, with which Javert pursues Valjean. He is as harsh with Fantine , the Thenardiers, and the students to take to the barricades to fight for their idea of justice. Zannelli’s Javert knows no gray area. The only emotion he shows is disdain at being pardoned by Valjean, a man to whom he’s never regarded as anything but a convict he’d like to see in jail. Zannelli’s bass is as rich and expressive as Matthews or Cupples’s soprano. You hear the conviction in his singing of “Stars” and the stark grimness of the soliloquy in which he cannot forgive life for causing him to be grateful or beholden to Valjean for his existence. Economically, Cline does not introduce all of the students or individuate them more than is necessary to keep the scenes at the barricades focused and efficient. The director is wisely more concerned with Marius, Valjean, Eponine, Javert, and Gavroche than he is with characters who probably won’t be remembered separately anyhow. All of the revolutionaries abet Thompson is making the student chorus strong and stalwart. Geoffrey Bruen and Patrick Ludt particularly stand out. A children’s ensemble also brings sound and texture to the anthems sung at the barricades. Zach Monroe captures the character’s sense of romance and ardor as Marius. His duets with Cupples are lovely, their voices blending well. The lovers have definite simpatico with each other, and Monroe is touching in his late book scenes with Valjean. He also conveys deep sorrow at Eponine’s death, showing he regarded her as a close friend and loved her, if in a different way from the one she would have preferred. Tim Woodward is eat-him-up adorable as Gavroche while also showing the “little person’s” grit, shrewdness, and courage. He brings energy to his scenes and has natural stage presence that will serve him well if he chooses to continue performing. Lexi Gwynn registers the proper shyness and fear as Young Cosette intimidated by Wefel’s Mme. Thenardier and frightened by a chore that demands she venture into woods in the dark. Cline’s economy includes the setting for “Les Miz.” The stacked chairs and heavy wooden beams that usually represent the barricades are left as set pieces on both sides of the stage while Cline has two metal staircases linked by a bridge serve in their place. His staging is just as effective and just as moving. Cline also does without the gate that usually separates Marius from Cosette when Eponine leads him to her. Again, the absence makes no difference, and Marius’s entrance is handled well and with the same effect as if he climbed a fence to reach his beloved. The only time I wondered about a choice was when Gavroche goes under the steps that serve for barricades to fetch ammunition the revolutionaries need but climbs the barricade, to his peril, in returning. Cline is known for his affinity to projections. Almost all of his productions include slides. His choices for “Les Miz'” are enlightening, as you see a representation of the French countryside, a chateau that can stand for Valjean and Cosette’s Paris home, a Parisian boulevard, and tunnels that serve as the sewers of Paris through which Valjean escapes while rescuing Marius. Only one cavil about the slides. To illustrate the police attack the freed Javert leads against the students, Cline shows tanks of recent vintage defending a square. The message is clear and apt, but this image is a bit too anachronistic to serve “Les Miz” well. It seemed out of place. The two small matters I raise amount to nothing. Cline’s “Les Misérables” is a resounding success. It will be at the Media Theatre until January 11. To see the mettle of this regional theater and enjoy a familiar hit in a way that accentuates its greatest qualities and strengths, you should make it a point to see this production. Even if you disagree with me or blanch at some of the production’s physicality, you can derive nothing but pleasure from the work of the “Les Miz” cast. Matthew Miller’s set is purposely rudimentary, but it includes a runway in front of the stage apron that is effective in several numbers. Xiachen Zhou’s costumes are always appropriate. His outfits for Briggs’s Thenardier is particularly astute. Troy Martin O’Shia’s lighting enhances Cline’s concept and is especially effective in Javert’s major scenes. Dann Dunn’s choreography serves each instance of dance and movement well, particularly in the scenes involving Fantine and in sequences featuring the Thenardiers. “Les Misérables” runs though Sunday, January 11 at the Media Theatre, 104 E. State Street, in Media, Pa. Showtimes are 7 p.m. Wednesday through Saturday, 2 p.m. Wednesday and Saturday, and 3 p.m. Sunday. No performance is scheduled for Thanksgiving, Christmas, or New Year’s Day. Supplementary shows are set for 7 p.m. some Tuesdays and 10 a.m. occasionally. Because of the holidays, schedules can vary, so please consult www.mediatheater.org when choosing dates and times to see “Les Misérables.” Tickets are $42, with discounts available, and can be obtained by calling 610-891-0100 or by visiting www.mediatheatre.org. Hi! I’m a bit of a camera amature. I would like to thank you for this great post. I certainly loved reading it. seeing your news in my mailbox!! This entry was posted on November 25, 2014 by nzoren in Theater Reviews and tagged Alain Boublil, Classic, Claude-Michel Schonberg, Elisa Matthews, Herbert Kretzmer, James Zannelli, Javert, Jean Valjean, Jean-Marc Natal, Jesse Cline, John D Smitherman, Kelly Briggs, Lauren Cupples, Les Miserables, Media Theatre, musical, Philadelphia Theater, Sarah Moya, Sean Thompson, Susan Wefel, Victor Hugo, Zach Monroe.